صادقی, مسعود, حسینی رمقانی, نسرین السادات. (1396). اثربخشی آموزش فرزندپروری مبتنی بر ذهن‌آگاهی بر اضطراب و نگرانی مادران دارای کودک مبتلا به اختلال بیش‌فعالی-کمبود توجه. 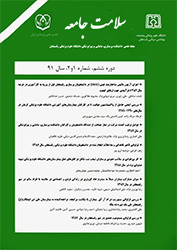 سلامت جامعه, 10(4), 1-11. مسعود صادقی; نسرین السادات حسینی رمقانی. "اثربخشی آموزش فرزندپروری مبتنی بر ذهن‌آگاهی بر اضطراب و نگرانی مادران دارای کودک مبتلا به اختلال بیش‌فعالی-کمبود توجه". سلامت جامعه, 10, 4, 1396, 1-11. صادقی, مسعود, حسینی رمقانی, نسرین السادات. (1396). 'اثربخشی آموزش فرزندپروری مبتنی بر ذهن‌آگاهی بر اضطراب و نگرانی مادران دارای کودک مبتلا به اختلال بیش‌فعالی-کمبود توجه', سلامت جامعه, 10(4), pp. 1-11. صادقی, مسعود, حسینی رمقانی, نسرین السادات. اثربخشی آموزش فرزندپروری مبتنی بر ذهن‌آگاهی بر اضطراب و نگرانی مادران دارای کودک مبتلا به اختلال بیش‌فعالی-کمبود توجه. سلامت جامعه, 1396; 10(4): 1-11. 1- استادیار، گروه روانشناسی، دانشگاه لرستان، لرستان، ایران. مقدمه: مادران دارای کودک مبتلا به اختلال بیش­فعالی-کمبود توجه، مشکلات مربوط به سلامت روان از جمله اضطراب و نگرانی بیشتری را تجربه می­کنند. در این راستا هدف پژوهش حاضر بررسی تأثیر آموزش فرزندپروری مبتنی بر ذهن­آگاهی بر اضطراب و نگرانی مادران دارای کودک مبتلا به اختلال بیش­فعالی-کمبود توجه بود. مواد و روش ­ها: طرح پژوهش به صورت نیمه­تجربی و از نوع پیش­آزمون – پس­آزمون با گروه کنترل بود. بدین منظور 30 نفر از مادران دانش­آموزان دختر مقطع ابتدایی مبتلا به اختلال بیش­فعالی-کمبود توجه بعد از نمونه­گیری هدفمند به صورت تصادفی به دو گروه مداخله و کنترل تقسیم شدند. از فرم والد پرسشنامه Conners به همراه مصاحبه بالینی به عنوان ابزار غربالگری و از پرسشنامه اضطراب بک و نگرانی پنسیلوانیا، برای گردآوری داده­ها در دو مرحله پیش­آزمون و پس­آزمون استفاده شد. برنامه آموزش فرزندپروری مبتنی بر ذهن­آگاهی، به مدت 8 جلسه 2 ساعته بر روی گروه مداخله اعمال گردید. داده­ها با استفاده از آزمون تحلیل کوواریانس یک متغیری مورد تجزیه و تحلیل قرار گرفتند. یافته ­ها: نتایج نشان داد آموزش فرزندپروری مبتنی بر ذهن­آگاهی منجر به تفاوت معنی­دار آماری بین مراحل پیش و پس از آزمون در نمره کلی اضطراب و نگرانی در گروه مداخله شد(001/0>p). به این صورت که در مرحله پس­آزمون بعد از کنترل نمرات پیش­آزمون، گروه مداخله نسبت به گروه کنترل اضطراب و نگرانی کمتری را گزارش نمودند. نتیجه­ گیری: با توجه به اثربخش بودن استفاده از برنامه فرزندپروری مبتنی بر ذهن­آگاهی در کاهش علایم اضطراب و نگرانی مادران دارای کودک مبتلا به اختلال بیش­فعالی-کمبود توجه، آموزش این برنامه در راستای کاهش فشار روانی این گروه از افراد جامعه پیشنهاد می­شود. 11-Assistant Professor, Dept of Psychology, University of Lorestan, Khorramabad, Iran. 2PhD Student in Psychology, Dept of Psychology, University of Lorestan, Khorramabad, Iran. Introduction: Mothers who have children with attention-deficit/hyperactivity disorder experience greater problems related to mental health including anxiety and worry. In this regard, the aim of this study was to evaluate the efficacy of a mindfulness-based parenting training on the anxiety and worry of mothers who have children with Attention-deficit/hyperactivity disorder. Materials and Methods: This Quasi-experimental study was conducted with a pre-test/post-test control group. For this purpose, 30 mothers of girls with Attention-deficit/hyperactivity disorder were randomly assigned to experimental and control groups. Using purposive sampling method. The Conners Parent Rating Scale and clinical interviews were used for screening and the anxiety inventory and Pennsylvania State Worry Questionnaire were used to collect data in two conditions [pretest and posttest]. Mindful Parenting course was implemented for the experimental group in 8 sessions of 2 hours each. Data were analyzed using ANCOVA. Results: Results of ANCOVA showed that the mindful parenting course resulted in a statistically significant difference between pre-and post-test scores so that the experimental group had a lower rate of anxiety and worry (p<0/001). Conclusion: Considering the results of this study, the mindful parenting course may be effective in reduction of anxiety and worry in mothers who have children with attention-deficit/hyperactivity disorder, this training course would be beneficial for mothers of children with this disorder. Alijani A, Rahmana M & Ghahari Sh. The effectiveness of mother’s cognitive- behavioral group interventions on the number of ADHD children’s behavioral problems. Procedia - Social and Behavioral Sciences 2013; 84, 874-8. Asherson P. ADHD across the lifespan. Medicine 2016;44(11):683-6. American Psychiatric Association. Diagnostic and statistical manual of mental disorders.5nd ed. Washington, DC: APA; 2013: 59-65. Tseng W-L, Kawabata Y, Gau SS-F. Social adjustment among Taiwanese children with symptoms of ADHD, ODD, and ADHD comorbid with ODD. CPHD 2011;42(2):134-51. Biederman J, Monuteaux MC, Doyle AE, Seidman LJ, Wilens TE, Ferrero F, et al. Impact of executive function deficits and attention-deficit/hyperactivity disorder (ADHD) on academic outcomes in children. JCCP 2004;72(5):757-66. Bagwell CL, Molina BS, Pelham WE, Hoza B. Attention-deficit hyperactivity disorder and problems in peer relations: Predictions from childhood to adolescence. Journal of the American Academy of Child & Adolescent Psychiatry 2001;40(11):1285-92. Marmorstein NR. Relationships between anxiety and externalizing disorders in youth: the influences of age and gender. JAD 2007;21(3):420-32. Haydicky J, Shecter C, Wiener J, Ducharme JM. Evaluation of MBCT for adolescents with ADHD and their parents: Impact on individual and family functioning. JCFS 2015;24(1):76-94. Theule J, Wiener J, Rogers MA, Marton I. Predicting parenting stress in families of children with ADHD: Parent and contextual factors. JCFS 2011;20(5):640-7. Margari F, Craig F, Petruzzelli MG, Lamanna A, Matera E, Margari L. Parents psychopathology of children with attention deficit hyperactivity disorder. RDD 2013;34(3):1036-43. Dean C, Myors K, Evans E. Community-wide implementation of a parenting program: the South East Sydney Positive Parenting Project. AJAMH 2003;2(3):179-90. Coatsworth JD, Duncan LG, Greenberg MT, Nix RL. Changing parent’s mindfulness, child management skills and relationship quality with their youth: Results from a randomized pilot intervention trial. JCFS 2010;19(2):203-17. Turpyn CC, Chaplin TM. Mindful Parenting and Parents' Emotion Expression: Effects on Adolescent Risk Behaviors. Mindfulness 2016;7(1):246-54. Orzech KM, Shapiro SL, Brown KW, McKay M. Intensive mindfulness training-related changes in cognitive and emotional experience. JPP 2009;4(3):212-22. Davis TS. Mindfulness-based approaches and their potential for educational psychology practice. Educational psychology in practice 2012;28(1):31-46. Bögels S, Restifo K. Mindful parenting: A guide for mental health practitioners. 1nd ed. New York: Springer; 2014: 313-15. Durukan I, Erdem M, Tufan AE, Congologlu A, Yorbik O, Turkbay T. Depression and anxiety levels and coping strategies used by mothers of children with ADHD: a preliminary study. AJP 2008;9:217-23. Bamber MD, Schneider JK. Mindfulness-based meditation to decrease stress and anxiety in college students: A narrative synthesis of the research. ERR 2016;18:1-32. Conners CK, Sitarenios G, Parker JD, Epstein JN. The revised Conners' Parent Rating Scale (CPRS-R): factor structure, reliability, and criterion validity. JACP 1998;26(4):257-68. Fresco DM, Heimberg RG, Mennin DS, Turk CL. Confirmatory factor analysis of the Penn State worry questionnaire. BRT 2002;40(3):313-23. Beek A, Epstein N, Brown G, Steer R. An inventory for measuring clinical anxiety: Psychometrie properties. JCCP 1988;56(6):893-7. Duncan LG, Bardacke N. Mindfulness-based childbirth and parenting education: promoting family mindfulness during the perinatal period. JCFS 2010;19(2):190-202. Rayan A, Ahmad M. Effectiveness of mindfulness-based interventions on quality of life and positive reappraisal coping among parents of children with autism spectrum disorder. RDD 2016;55:185-96. Bögels SM, Hellemans J, van Deursen S, Römer M, van der Meulen R. Mindful parenting in mental health care: effects on parental and child psychopathology, parental stress, parenting, coparenting, and marital functioning. Mindfulness 2014;5(5):536-51. Teasdale JD, Segal ZV, Williams JMG, Ridgeway VA, Soulsby JM, Lau MA. Prevention of relapse/recurrence in major depression by mindfulness-based cognitive therapy. JCCP 2000;68(4):615-23. Baer RA. Mindfulness training as a clinical intervention: A conceptual and empirical review. Clinical psychology: Science and practice 2003;10(2):125-43. Brown KW, Ryan RM, Creswell JD. Mindfulness: Theoretical foundations and evidence for its salutary effects. Psychological inquiry 2007;18(4):211-37. Stahl B, Goldstein E. A mindfulness-based stress reduction workbook. 1nd ed. Oakland: New Harbinger Publications; 2010: 56-141.